Venous Disease occurs when you have a medical problem resulting from unhealthy veins. Venous Disease becomes a medical problem when it causes leg discomfort and other medical symptoms. 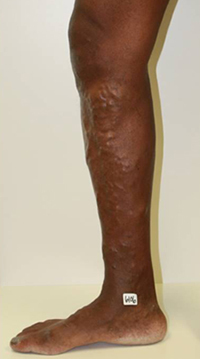 Varicose veins result from the overflow and are a physical manifestation of unhealthy veins / Venous Disease. Of note, most varicose veins are under the skin and you can’t see them! What are Varicose Veins and reflux? Overall facts – Venous Disease gets worse with age and affects 80 million Americans. About 20 % of the adults have Varicose veins. The number one contributing cause is genetics / hereditary and more than half have a family history of them. Women are affected three times more than men because of pregnancy and female hormones. What causes Venous Disease and Varicose Veins? Normally, veins return the blood to the heart via uphill flow using Normal valves which act like one way double doors. If the veins walls are weak and the vein has weak or Abnormal valves, the vein permanently loose its ability to carry blood against gravity from the legs back up to the heart, and blood flows downhill toward the feet (reflux) instead of uphill towards the heart. With downhill flow (reflux) the blood pools in the legs stretching, dilating, enlarging and twisting the leg veins. With time, this process can cause the medical symptoms and What are Varicose Veins and reflux? Which veins are unhealthy? In the leg there are two distinct vein systems. 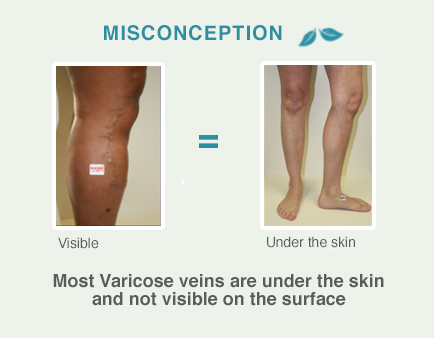 One is the superficial vein system which lies just beneath the skin but usually can’t be seen from the surface. 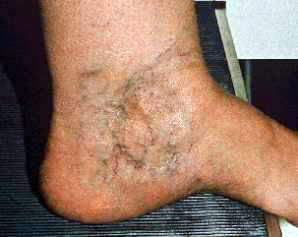 Usually, problematic veins begin in the superficial system. 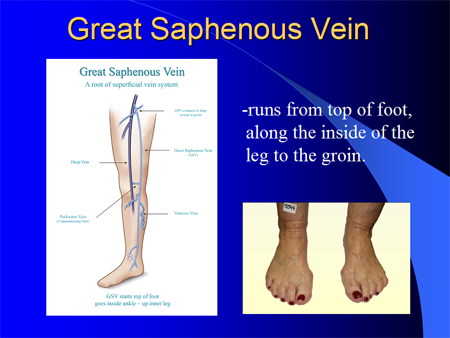 The two main veins in the superficial system are the great saphenous vein and the small saphenous vein. 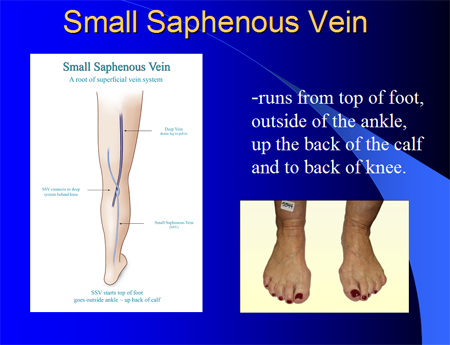 Most of the problems from Venous Disease result from reflux in these saphenous veins. 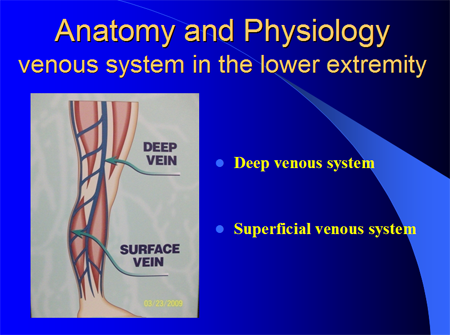 The second vein system in the leg is the important deep vein system. The deep vein system is located deep within the muscles. The deep veins carry most of the blood from the leg back to the heart. Varicose veins develops when larger veins under the skin can no longer hold or accommodate the downhill flow of blood and blood overflows into skin branches. The Varicose veins start under the skin and with time slowly bulge and become visible. Visible Varicose veins are usually a predictor that a bigger problem is occurring under the skin. What are Varicose Veins? Varicose veins are enlarged, weakened, dilated veins that have permanently lost their ability to carry blood from the legs back up to the heart against the force of gravity. As the blood refluxes or flows downhill in the leg and pools due to gravity, the veins overfill giving them their typical unsightly bulging appearance. Varicose veins cause tired, heavy, aching, throbbing, swollen legs which are typically worse at the end of the day. Nighttime leg cramps and leg restlessness (sometimes called Restless Leg Syndrome) are also very common problems caused by Varicose veins. 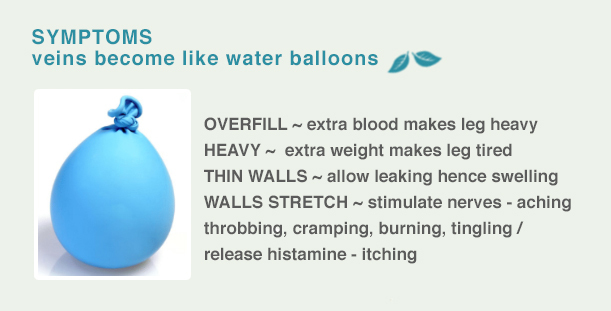 Treatment of the diseased veins will eliminate these symptoms. If left untreated, Varicose veins always worsen over time, and may lead to the formation of blood clots (thrombosis), inflammation of the vein (phlebitis) and inflammation of the skin (dermatitis), and finally ulceration. What are Varicose Veins and reflux? What Causes Venous Disease / Varicose veins? Heredity is the number one contributing factor causing Varicose veins. A genetic tendency causes veins to weaken and wear out over time. The greater this genetic tendency the sooner it will happen. So regardless of treatment, if you have a strong hereditary predisposition, you will probably form new problems as time goes on. Other contributing factors include pregnancy, obesity, hormone-containing medications, standing for long periods, and traumatic injury to the leg. In most cases, nothing can be done to prevent veins from wearing out, but if effective treatment is given early in the course of the disease, complications like phlebitis, blood clots and ulcerations may be prevented. The unhealthy backward flow is responsible for many the medical symptoms. Normal leg veins work against gravity taking blood from the legs back to the heart. Healthy or normal one way flow valves in leg veins help prevent blood from flowing backwards, or refluxing, toward the feet. When these valves malfunction and backward flow occurs, it is called venous reflux. 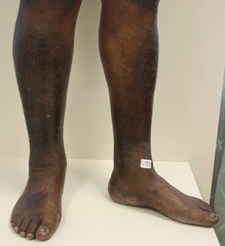 When blood begins to pool in the legs, frequently the veins can not accommodate all the pooling blood and blood overflows into nearby branches like a river over flowing into a creek. This overflow mechanism causes varicose veins to form, distend, bulge and become symptomatic. At this point, the condition is called Chronic Venous Disease. If venous reflux is long standing and skin changes begin occurring, it’s sometimes called Chronic Venous Insufficiency. 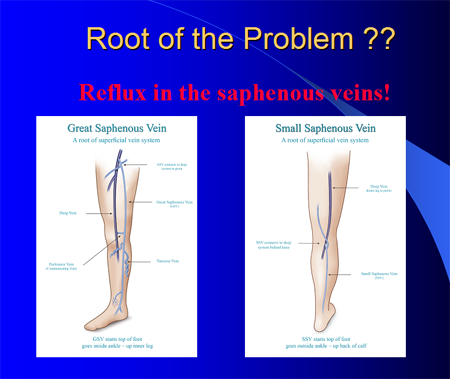 The reflux in the veins causes pooling, increased pressure and inflammation, especially in the lower leg. The pooling causes legs to be heavy. A heavy leg becomes tired. The nerves in the dilated vein wall become activated causing the leg to feel achy, tender, burning, and tingling. 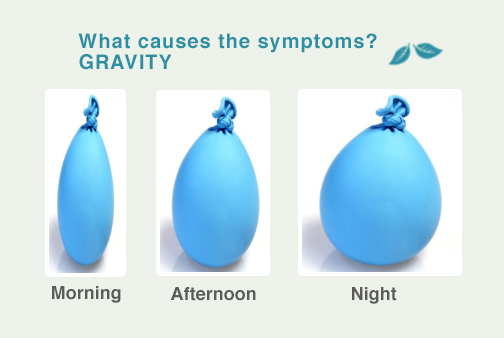 Because of gravity, the legs vein progressively enlarge throughout the day, so these medical symptoms are usually worse with long sitting, standing or at the end of the day. How are Varicose veins treated? Usually bulging varicose veins are treated with a combination of procedures. Usually pressure in the varicose veins is first decreased by closing the root saphenous veins via laser ablation. Then, the veins are either closed via Foam sclerotherapy or removed via ambulatory phlebectomy which is a micro-extraction technique. The best treatment is based upon the extent of your specific condition and your overall health and age. The doctor will recommend a duplex ultrasound examination to assess the severity and extent of your vein disease, most of which may not be visible on the surface of the leg. Without an accurate ultrasound map of your veins we cannot determine the source of your problem or treat it effectivelywing into a creek. This overflow mechanism causes Varicose veins to form, distend, bulge and become symptomatic. If venous reflux is long standing and skin changes begin occurring, it’s sometimes called Chronic Venous Insufficiency. The reflux in the veins causes pooling , increased pressure and inflammation, especially in the lower leg. The pooling causes legs to be heavy. A heavy leg becomes tired. The nerves in the dilated vein wall become activated causing the leg to feel achy, tender, burning, and tingling. Because of gravity and pooling, as the day progresses, the leg veins progressively dilate and enlarge to accommodate the blood flowing toward the feet. At this point, the condition is called Chronic Venous Disease. Night Cramps and Restless Legs. Leg pain, night cramps and restless legs are thought to be caused not only from the direct effects of vein wall stretching, but also from the effects of congestion or pooling in the tissue and muscles. This effect can also contribute to irritable, tender muscles. It’s postulated that the leg muscles tighten (cramp) or move (restlessness) in an attempt to squeeze the blood out of the leg. 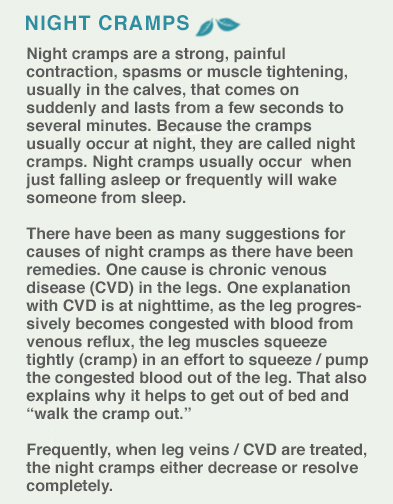 When leg cramps and restlessness occur at the end of the day and Venous Disease is present, treating the veins usually either improves or alleviates the night cramps and restless legs. Swelling (edema) is also caused from venous reflux. 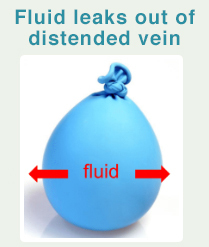 Blood pooling causes increased pressure in the distended Varicose veins and causes veins walls to become “leaky.” This allows fluid inside the veins to leak outside the vein into surrounding tissue causing swelling (edema.) The swelling can cause the legs to ache and feel heavy. Like the leg symptoms, the swelling is worse at the end of the day and better in the morning. After years and years of reflux, the constant increased pressure in the veins can cause ankle spider veins. 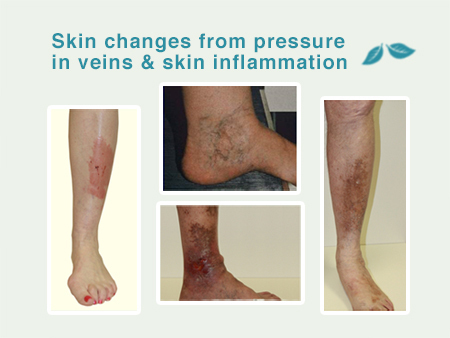 The increased pressure in the veins eventually causes skin inflammation which can result in redness, called venous stasis dermatitis. With continued pressure, the skin eventually becomes reddish brown (hyperpigmentation), and may progress to hard, thick, leathery, dry and itchy skin. In severe cases, skin eventually breaks down to form venous ulcers. Although treatment may not reverse all of the skin changes, treatment aimed at relieving the swelling, decreasing the pressure and decreasing the inflammation in the veins will improve symptoms and possibly close venous ulcers and prevent progression. Pain occurs as the varicose vein and the vein valves become more abnormal. The venous reflux allows blood to pool in the veins, distends and stretches the veins and causes legs to feel: tired, aching, heavy, cramping, swollen, tired, throbbing, restless and itchy. The pooling causes increased pressure inside the veins, stretching the pain fibers which results in pain. Leg pain is caused not only from the direct effects of vein wall stretching, but also from the effects of congestion or pooling in the tissue and muscles. The symptoms usually feel worse at the end of the day. Swelling (edema) is also caused from venous reflux. Blood pooling causes increased pressure in the distended Varicose veins and causes veins walls to become “leaky.” This allows fluid inside the veins to leak outside the vein into surrounding tissue causing swelling (edema.) The swelling can cause the legs to ache and feel heavy. 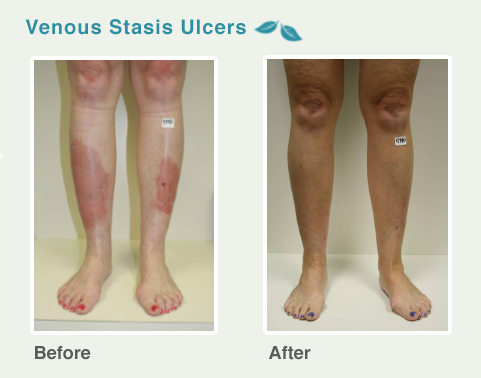 When venous disease and blood pooling become severe, venous stasis ulcers can occur in the skin. These ulcers usually occur around the ankles and are thought to be caused from long term blood pooling and pressure inside the vein. 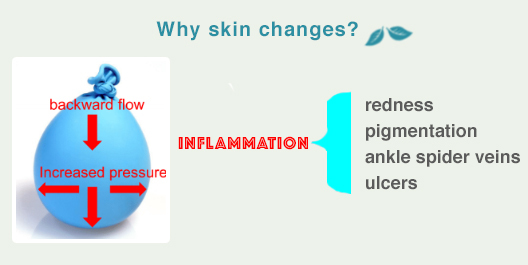 This increased skin pressure then causes inflammation and skin ulcers begin to form. These venous ulcers can be painful, and topical treatment can be lengthy and frustrating. In many cases, if a venous reflux is diagnosed and considered a cause for the venous ulcer, treating the Varicose veins will redirect the blood flow to healthier veins, decrease the pressure in the area, which will then decrease the inflammation in the skin and most likely close the leg ulcer. Varicose veins are a common during pregnancy, and they will become larger and more painful with each subsequent pregnancy. After childbirth, most of the pain and swelling will subside, however the varicose veins will never return to normal. Almost 70 percent of women develop spider veins during pregnancy. They begin to develop within a few weeks of conception. The majority of these spider veins will disappear between three and six months postpartum. Because of the hormonal changes and the increased risk of blood clots from those hormonal changes of pregnancy, it is generally recommended to wait and treat varicose veins approximately 4 months after delivery. Venous Duplex Ultrasound is the gold standard for diagnosis of vein disease. At CVC, the duplex ultrasound is usually done at your initial consultation visit by a qualified, venous ultrasound technician. The technicians look especially at the leg’s major superficial veins, the great saphenous vein and the small saphenous veins, which lie under the surface of the skin. These veins, when abnormal and refluxing, are usually the root of most Varicose veins medical problems. The ultrasound evaluation provides many valuable pieces of information about the leg veins and is vital in establishing an accurate diagnosis, which is the only way to assure the most effective treatment of your varicose veins. First, it determines if there is healthy flow or unhealthy reflux in the veins. The ultrasound image provides information about the blood flow inside the leg veins and can determine if the vein has normal, healthy valves that work against gravity taking blood from the legs back to the heart. It can also determine if the vein has unhealthy valves allowing blood to flow backwards, or reflux, toward the feet. Second, the ultrasound can determine the size, location and the various branches and connections are "mapped-out." This enables a record to be made showing the precise location of the leaking valves. Third, the ultrasonographer can also evaluate your leg’s deep vein system for the presence of a dangerous blockage by a clot, also called a deep vein thrombosis (DVT). Your treatment plan will be specifically designed and individually tailored for the extent and severity of your specific condition. Here are a few important aspects to remember. First, usually a combination of the treatment options described below may be necessary for your comprehensive treatment. Second, if the endovenous laser ablation and ambulatory phlebectomy are recommended, usually only one leg can be treated at one time. Third, a series of treatments over several appointments may be necessary. Fourth, all treatments are performed in our office setting. The most conservative way to manage Varicose veins disease is wearing graduated compression stockings (usually knee length, but sometimes thigh length hose are needed). Compression stockings used to be prescription, but now can be bought over the counter. 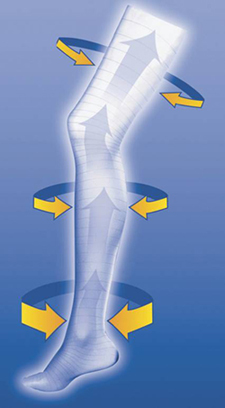 Compression helps alleviate the swelling and pain caused by Varicose veins. These stockings will also help heal any skin inflammation or ulcerations which have developed. However, there has never been any evidence to show that compression stockings prevent the formation of Varicose veins. Since the diseased veins that are causing the symptoms are not being eliminated, the compression stockings only work while they are worn and have to be worn indefinitely. Conservative therapy also involves the use of anti inflammatory medications, like ibuprofen, increase exercise and frequent leg elevation. Most insurance companies require patients have a trial of conservative therapy for 6 weeks - 3 months before they will consider reimbursement for treatment. 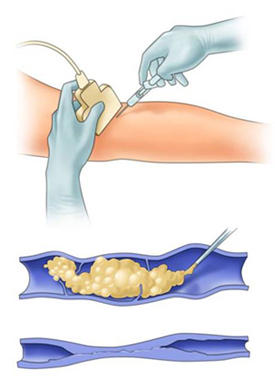 Foam sclerotherapy is nothing more than injecting air mixed with a liquid sclerosing solution rather than just the liquid sclerosing solution into the veins to be treated. 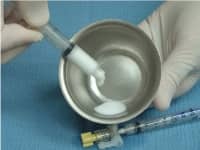 Both small and large veins can be treated using a foam technique with or without ultrasound guidance. The amount of foam used is limited to avoid side effects and both techniques may be used together to obtain optimal results. 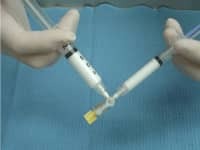 When injected inside a vein, the micro foam displaces the blood (rather than mixing with it) creating a better contact with the vein wall. 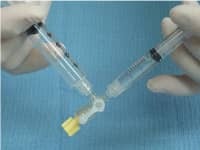 Improved contact between the medication and vein wall gives better and faster results. The expanded volume of the mixture also allows for less medication to be used at a weaker strength. Ambulatory phlebectomy or “hook” phlebectomy is a micro-extraction procedure used to remove Varicose veins, both large and small, which are close to the surface through very small (1/8 inch) micro-incisions. 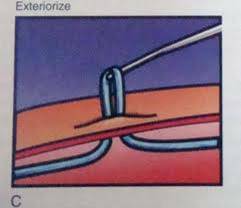 The micro-incisions are so small that they are closed with sterile tape and not stitches. Once healed they are rarely visible. Bruising will occur and will take a few weeks to go away. A compression bandage is worn for only 3 or 4 days. When removed, patients are amazed how good the leg looks with the “ropey” veins gone. Then A compression stocking is worn for another week. Patients can return to normal daily activities including work the same day and walking is encouraged. Contrary to the old-fashioned regimens of bed rest after vein treatment, our patients are instructed to walk as much as possible in the days following each treatment. This helps to re-route blood to the deeper, healthier veins. A compression bandage is worn for only 3 or 4 days after endovenous laser ablation and ambulatory phlebectomy procedures. A shower bag is occasionally supplied for bathing with the dressing in place. Compression stockings are worn for short periods after all treatments to assist in healing and reduce any mild discomfort or swelling which may occur. Most of the time, the procedures are preformed under local anesthesia, so you may drive yourself to and away from every appointment. You may return to your usual activities directly following a treatment. After the main procedures, you will be given follow up visits. These….follow up visits are very important. During these visits (usually two) we assess the efficacy of our treatment and evaluate your body’s healing response to the therapy. Often it is during this period that additional sclerotherapy, with or without Ultrasound guidance, is performed to insure the best long term results possible. Historically, major surgery, commonly known as “vein stripping” was used to treat the larger Varicose veins. Today, “stripping” is obsolete and rarely, if ever needed. This procedure is painful, requires a hospitalization and a general or regional anesthetic. The permanent scarring and lengthy recovery time from “stripping” was un-acceptable. Endovenous laser ablation and ambulatory phlebectomy procedures, with emphasis on esthetically cosmetic pleasing results without permanent scarring, has increasingly replaced the traditional Vein Stripping Surgery.